Care for your weak, brittle and lifeless hair with the TIGI Urban Antidotes Resurrection Tween Duo, a shampoo and conditioner dream team that boosts strength and stamina. When hair has been overprocessed and worked too hard, it can look and feel like there’s nothing left to do but cut the damage away. Before reaching for the scissors, reach for this duo of daily hair protectors. Bed Head Resurrection is a deeply nourishing pair targets the areas that are most deeply in need of care and greatly improves the look and feel and damaged hair. With its moisturising, repairing and health-boosting ingredients, TIGI Resurrection brings dead-end hair back to life. Added anti-static and smoothing agents make hair look glossy and groomed, while anti-colour fade technology and in-built thermal protection protects your hair for the future. Work the Bed Head Urban Antidotes Resurrection Shampoo into a lather, and rinse out well. Next, apply the Bed Head Urban Antidotes Resurrection Conditioner through the mid lengths to the end of the hair, leave for several minutes and then rinse away. 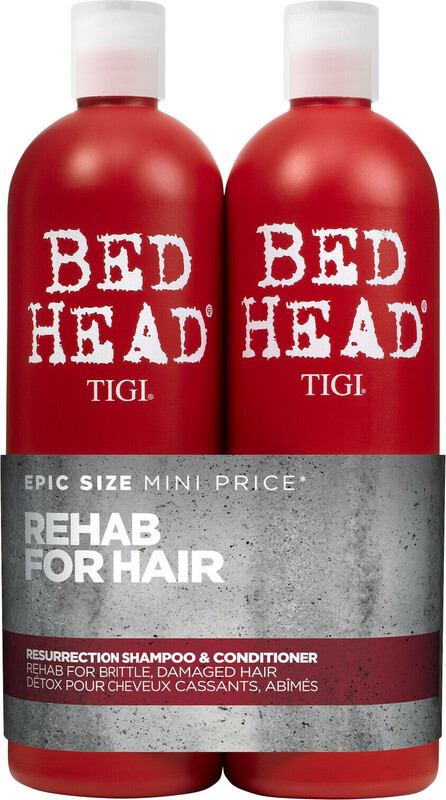 TIGI Bed Head Urban Antidotes 3 Resurrection Shampoo and Conditioner Tween Duo 2 x 750ml is rated 4.9 out of 5 by 22. Rated 5 out of 5 by Kolosl from Best shampoo! I have tried so many products looking for a decent shampoo and conditioner for my aging, highlighted hair and this one is the best I’ve found. Really conditions well and smells wonderful too. Rated 5 out of 5 by Nettie18 from Damaged hair I have very fragile damaged blonde fine hair and have just started using this combo of shampoo and conditioner. It's early days yet but I think it may help, my hair feels softer after use not so much like shredded wheat, I don't know yet if it will help with the breakage or stop it falling out. Only time will tell. Rated 4 out of 5 by KL1234 from Great shampoo but.... The product is great. A thick formula but the smell is not for everyone. For me it's yucky. Smells like the Australia shampoo. Rated 5 out of 5 by Kristina33 from AMAZING shampoo I love its fragrance and it makes my hair stronger and shining!